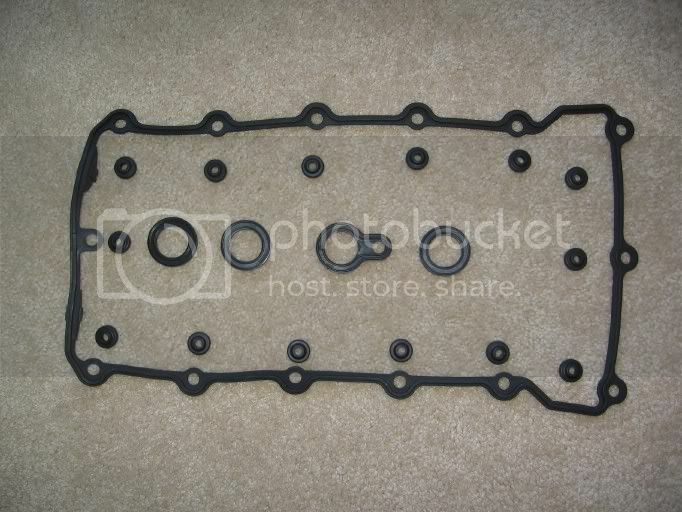 M42/44 / 318ti Valve Cover Gasket DIY. PICS! Knowledge Base How to articles and things explained. 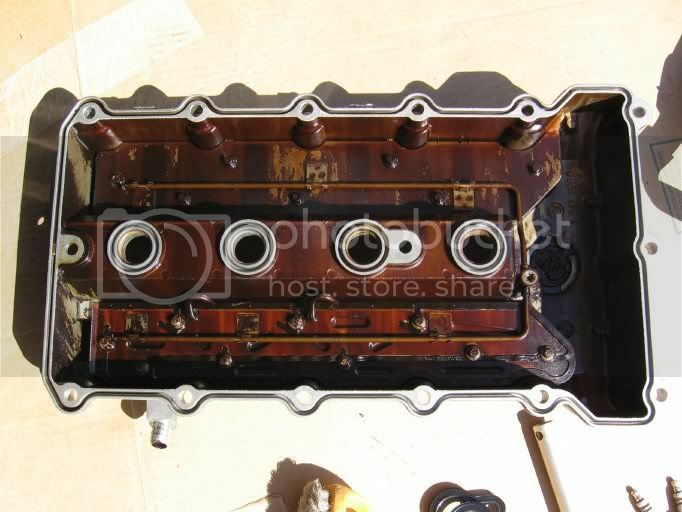 * DIY * Replace the Valve Cover Gasket and Spark Plugs on the M42/44 Engine. • High Temp RTV or any gasket sealer you desire. #2. Disconnect Positive Battery Cable. 10 mm combo wrench. 318ti Only? #3. Remove Battery. 10mm Combo or 10 mm Socket on battery hold-down bolt. 318ti Only? #4. Unbolt Battey Box. Two 13mm bolts underneath battery. 318ti Only? Battery + Battery Box Removed. You can see the two battery box bolts rethreaded so I won’t lose them. I think the 318i/is/ic has the battery in the back, so I guess you can omit steps #2, #3, and #4. #5. Unplug and unscrew (Two 8mm Nuts) Ignition Coil Pack. #6 Unplug Spark Plug Boots. Blue BMW tool in use. Just unsnap them for now. #8. 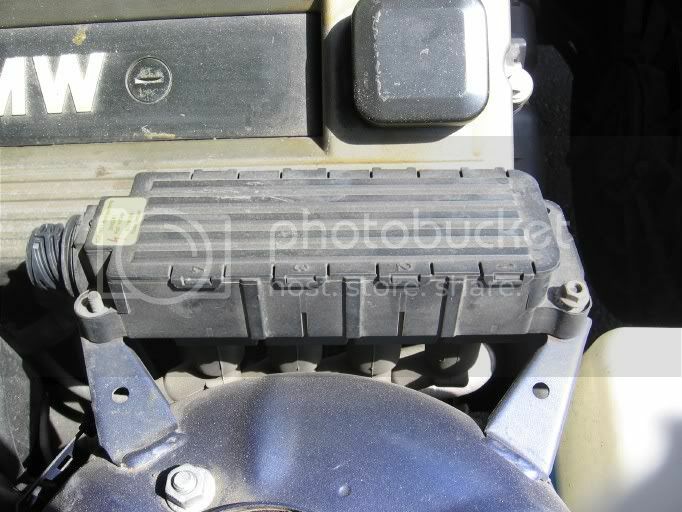 Remove the ignition pack, spark plug wires, plug wire channel w/ heat shield, and insert tray as one unit. The insert tray lightly clips into the top of the valve cover. Use a flathead screwdriver to unsnap it. The wires hang up in the passenger side rear corner, so it takes some wiggling to get the whole thing out. #9. Optional? To make it easy, remove the ducting above and behind the wiring channel. 7mm Socket & Philips Screwdriver. 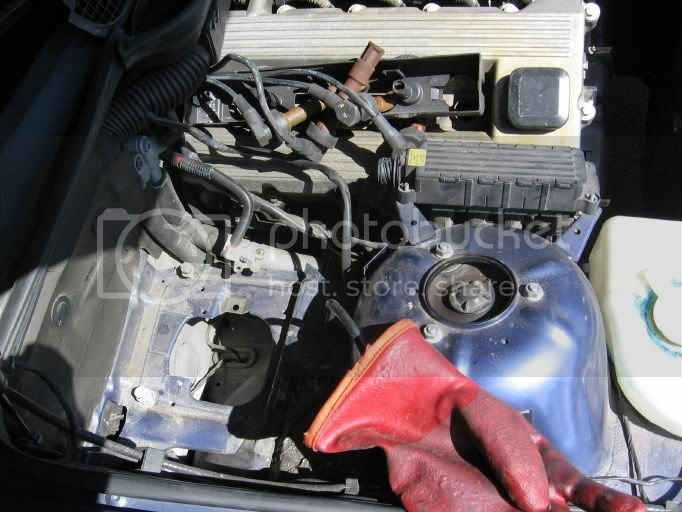 It’s the same one that you remove to replace the 318ti cabin filters. You can see the dirty filters hidden back there. Now would have been a good time to have had new ones ready..... Idiot! I don’t really know if this is necessary for 318i, 318is, or 318ic people. It may not even be necessary for the 318ti, but I thought it would make things easier to pull the valve cover away. #10. Remove the spark plugs. 16mm Socket? First, blow compressed air into the spark plug holes to keep debris from falling into the cylinders when you remove the spark plugs. #11. Unbolt all 15 valve cover bolts. (10mm socket?) With the battery box and wiring duct removed, they are all easily accesible. Here’s what the valve cover bolts look like. 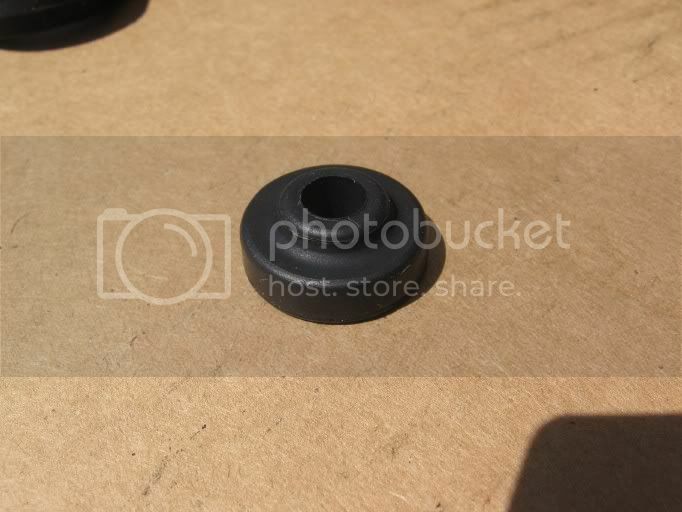 You will be replacing the black rubber part. The Smaller bolt (two of them) are from the spark plug channel; the perimeter bolts are the longer ones. All bolts removed; cover ready for removal. #12. Gently pull the valve cover away. Do NOT pry it. I used the valve cover breather pipe to pull up gently. Opened up. #13. Underside of valve cover. Pull old gaskets away and clean up cover to your liking. Insert new gaskets. New gaskets installed and ready to reinstall.